Both speakers in this session summoned science. But just a dram of detail is divulged now. Mr. Barnum’s talk (Mr. Cameron did not attend) will be posted in full on this website after all the conference events are summarized. Prof. Risseeuw’s investigations are ongoing, therefore the aim is to avoid mischaracterizing his conclusions. George Barnum says that his job is about telling stories. 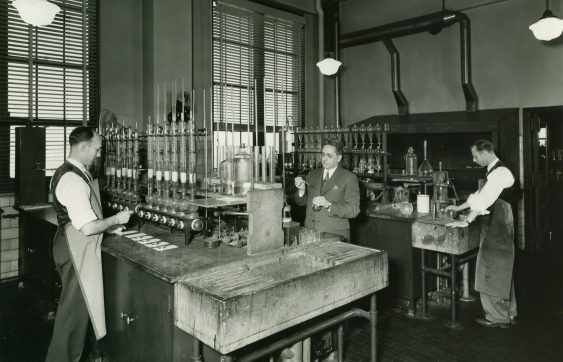 Aided by statistics and vintage photographs, he made us see just how enormous and industrialized the Government Printing Office once was. But the story within the story that he told conference attendees involved the GPO’s technical division, which developed and tested the materials they used and how they strived to solve printing related problems presented by other government agencies. During World War II, GPO expertise was called upon to circumvent a particular enemy action. They excelled at this challenge and the demand for the resulting products was so great that it was recognized as essential to the war effort. John Risseeuw claimed his talk held no magic, but his project is mesmerizing. Early in his career he had learned the axiom: foundry type is harder than Linotype or Monotype, but experience taught him: all foundry type is not equal. Later, near retirement, he made time to investigate this. He reviewed the literature, procured types from varying foundries, countries, and historical periods, then established a baseline. 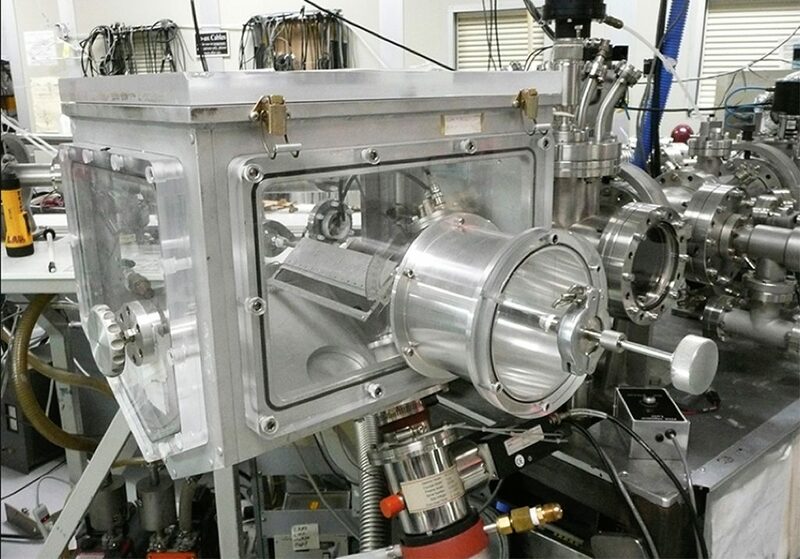 Access to an ion beam lab provided the means for analysis. 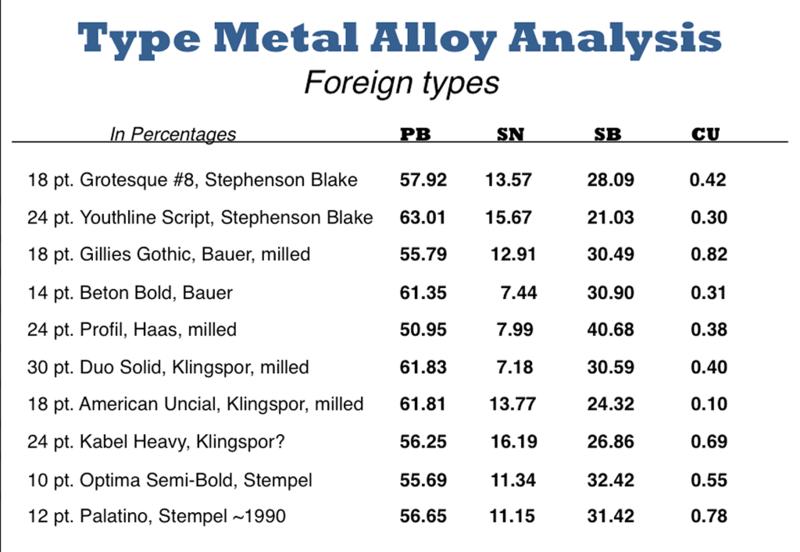 His comparisons showed the percentages of the type alloy elements lead, tin, and antimony, as well as traces of copper, which increased hardness, and other trace elements. 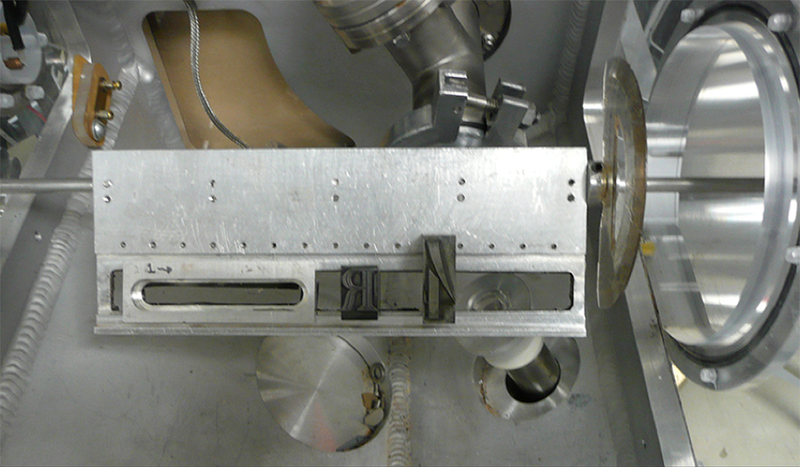 Shunning destructive hardness tests he consulted metallurgical tables and visual cues. Researchers who had collected data via different analytics led him to review his methodology, ask new questions, and acquire type he could dissect. Risseeuw admitted that there are more tests to be made and that “it all looks like so much fun.” He invited collectors and curators with access to vintage type that could be sampled to contact him. Discussion pondered the calibration of typecasting machinery. One of several of Risseeuw’s data tables. The elements are lead (Pb), tin (Sn), antimony (Sb), and copper (Cu). Paul Moxon is APHA's website editor in chief. He is a studio letterpress printer, workshop instructor and author of Vandercook Presses: Maintenance, History and Resources. He has held fellowships at Rare Book School and the Newberry Library. He presented at the 2010 and 2012 APHA conferences. Turnaround Time in a 17th-century Printing House?